It's been a busy few days for the folks at Google as the company announced on Tuesday that it's rolling out yet another update - this time one for its YouTube app. Available now in iTunes, the update is optimized for the iPad and iPhone 5. Google first pressed play on its independent YouTube app for iPhone and iPod touch three months ago, conspicuously leaving Apple's tablets out of the loop. 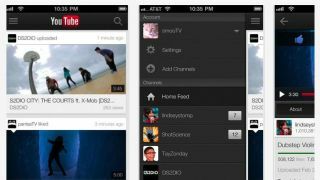 With the iPhone 5's 4-inch screen, the app needed a retooling that fitted YouTube flicks into its entire screen space, not mention filled out the iPad. While its design is catered to conform to the devices' larger screen sizes, the update also adds enhanced AirPlay support, bolstering videos streamed onto Apple TVs - perfect for HDTVs and other large viewing apparati. As part of the update, videos start faster and run with less hiccups, a Google blog post boasted, and VoiceOver improves accessibility. YouTubers can now tap a logo to open their channel guides and click on links within video descriptions. Adding and removing videos from playlists is another update feature. The YouTube update is rolling out globally today and follows the Google team's earlier news that Gmail version 2.0 is now available for iOS. That update came after another Gmail update, this time for Android, headed out on Monday. iOS 6 is the first Apple operating system to not include preinstalled a YouTube update, just as it shed Google Maps. Google, however, isn't letting its fans wallow in inconvenience.